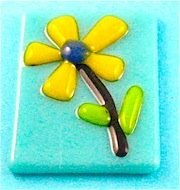 This fused glass flower pendant is a simple construction made from small glass pieces and contour fused to a colored base. 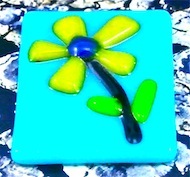 The pendant is easily made using one piece of opaque fusing glass as a base with small pieces for the flower and a piece of stringer for the stem. By contour fusing a nicely raised flowed will be the end result. It can be made from either bullseye or System 96, size and colors may be varied to suit design ideas. To make this pendant you will need the following items. Step 1. Cut one piece of opaque turquoise, 1 3/8 x 1 3/4 inches overall. Step 2. Cut small pieces of yellow for the petals about 1/2 inch long and 1/4 inch wide at the top. Cut small piece of blue for center of flower. Cut small pieces of green for leaves. Step 3. Bend stringer over candle flame to make flower stem. Step 4. Assemble cut pieces on prepared kiln shelf and place shelf into glass fusing kiln. Step 5. Bring kiln up to contour fusing temperature fairly quickly. Bulllseye temperature around 1425° F (775° C), System 96 around 1400° F (760° C). Check during fusing process to ensure that the item does not overheat and begin to pull in and fully fuse.When fused, item should be nicely contoured, switch off fusing glass kiln and allow to cool to room temperature. A small bail can be fitted to the rear of the item with two part epoxy glue. Our thanks to our Facebook friends at Vitrales Peru for their kind permission to use this design. There are some nice instructional videos on their site along with samples of their wide variety of fused items. The videos can also be found on YouTube.